Sheer Brilliance Is Key In This Powerful Production. Some musicals have outstanding overtures. Some have incredible finales. “Ragtime” has one of my all-time favorite introductory scenes. In the show’s first ten minutes three diverse cultures vividly come to life in the New York of 1906. There are the privileged upper class whites living in the New York suburb of New Rochelle; African Americans living in downtown Harlem; and Jewish immigrants from Eastern Europe who have found space in lower-Manhattan tenements. The New Rochelle family consists of Mother, Father, Younger Brother, Grandfather, and Little Boy. Father is leaving the home to travel for a year with Admiral Peary’s expedition to the North Pole. He is leaving Mother at home to be “in charge” for the first time in their marriage. The Harlem citizens are Coalhouse Walker, Jr. (a man-about-town musician), his girlfriend (Sarah), and their friends. 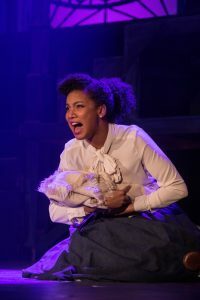 Sarah has become pregnant by Coalhouse, and flees to New Rochelle, where no one will know her to give birth to the baby, hiding it in a local garden. Coming from Latvia are Tateh, a Jewish widower, who is bringing his daughter from poverty-stricken Eastern Europe, with the desire of finding some degree of happiness in the New World. Characters in each of the cultures initially appear unaware of the other culture’s existence, preferring to live only in their immediate sphere. This is about to change when Mother finds the newborn black baby in her garden, and shows innate caring and capabilities by bringing mother and baby into her home to give them refuge. Coalhouse frantically looks for his beloved Sarah and ultimately finds her in the upper-class neighborhood of New Rochelle. The local citizens there are openly racist, especially men in the fire department, even though some of them have faced discrimination in their new surroundings, having come from Ireland. They want nothing to do with anyone of color. While waiting for a train at the New Rochelle train station Mother meets Tateh and his frightened daughter. He is equally frightened, and has placed a rope around the daughter’s waist, pulling her along with fear he might lose her. This is a chance encounter that will ultimately be rewarding. These divergent characters have difficulty co-existing, accepting other cultures, and meshing into a single society. They initially appear to be ignorant of the other cultures’ existences, preferring to live only in their immediate sphere. ”Ragtime” first appeared in 1975 as an historical novel by E. L. Doctorow. A movie version of the book appeared in 1981. The intertwined stories of the three cultures were then set to the impressive music and lyrics of Stephen Flaherty and Lynn Ahrens, with book for the musical by Terrence McNally. The show was introduced in Canada in 1996, but did not arrive on Broadway until January of 1998. It was very successful, received great audience acclaim, honored with several awards, and ran for 834 performances. 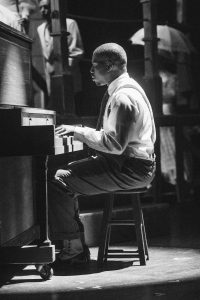 The story is successfully told to continually-interesting music: marches cakewalks, gospel, and the ever-enduring syncopated ragtime. The music has rarely, if ever, sounded better than currently heard on the MAC stage. Among the musical highlights are “Journey On,” “Gettin’ Ready Rag,” “Wheels of a Dream,” “Sarah Brown Eyes,” and “He Wanted to Say.” The format itself is not perfect. The overly-long Act I seems to be ready to happily conclude two or three times before some unpleasant situations must be faced. Most performers in the large cast play multiple roles, including the impressive Daniel Harkins who turns up as Grandfather, J. P. Morgan, and Admiral Peary, switching roles, costumes and wigs something like 15 times in the course of the evening. The show’s author cleverly inserted the lives of several famous people to the story. We meet Harry Houdini, Evelyn Nesbit, Brooker T. Washington, J. P. Morgan, Henry Ford, Stanford White, Harry K. Thaw, Admiral Peary and Emma Goldman –all historical New York figures of the early 1900s. 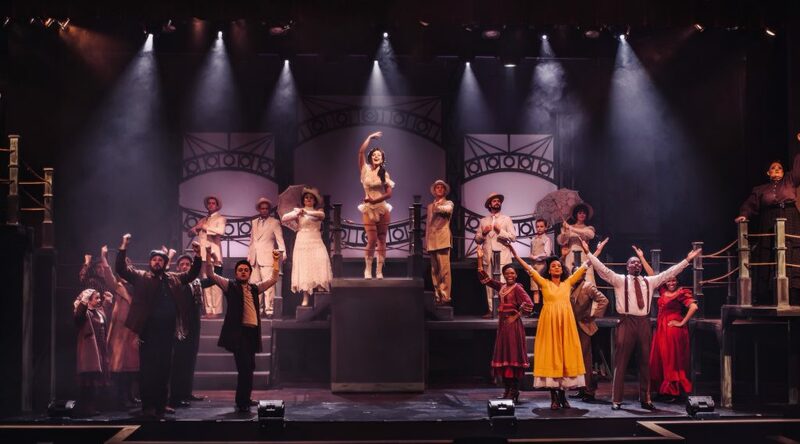 Supporting players include Jalyn Courtenay Webb, impressive as Emma Goldman, Kyle Smith as Younger Brother, Hugh Buttterfield as Willie Conklin, and Charlotte Campbell as the saucy Evelyn Nesbit. 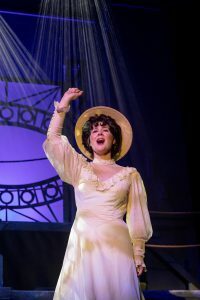 Produced by Kurt Terrio, the MAC production is flawlessly directed and choreographed by Joseph Callahan, with Jalyn Courtenay Webb as Music Director. 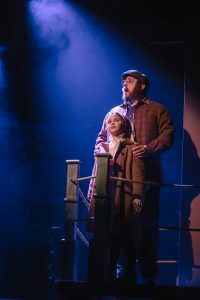 Scenic design and lighting by Chad Bonaker, costumes by Charlotte Campbell and Alisa Metcalf, sound by Patrick Lapinski. The set is not attractive, but is cleverly functional. The orchestra is successfully conducted by Casey Cropp. Choral music and stage movement are extremely impressive throughout. 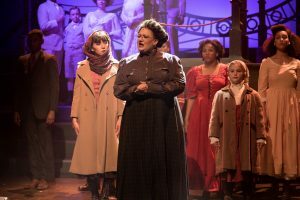 The costumes, the choral work, the directions, the acting, the music, sound and lighting all work to perfection, resulting in one of Midtown Arts most triumphant productions, maybe even matching their “Les Miserables” wonder of a few seasons ago. Unfortunately, the basic themes of social injustice and intolerance remain as disturbing as ever, with little true advancement since the New York of 1906.